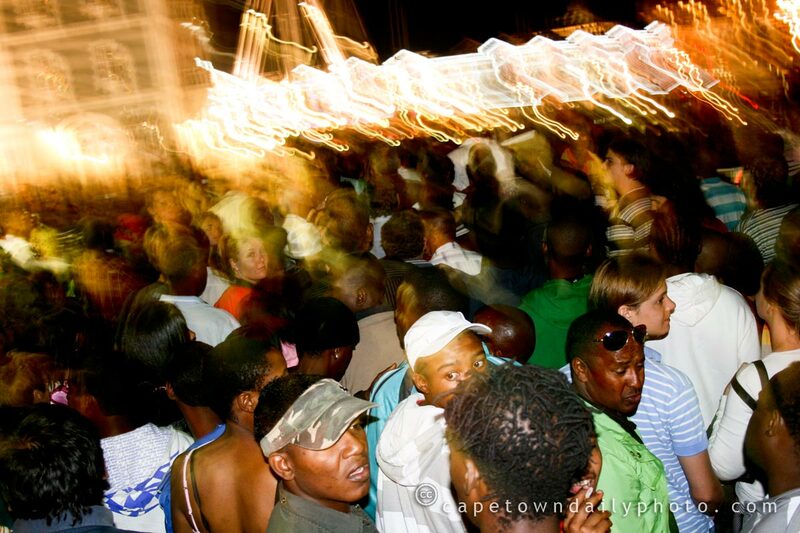 As I said in yesterday's post, it really was busy at the V&A Waterfront last night. If you're familiar with the Waterfront then you'll likely remember the narrow swinging bridge at the Clock Tower. This crowd on the Clock Tower side was trying to change places with a similarly large crowd on the other side. Speaking of the Clock Tower: in case you don't know what it is, the Clock Tower was the old port master's watchtower, built in the late 1800s when the harbour was still full of old-style sailing ships. The tower houses a huge clock (hence the name "Clock Tower"), which was about 5 minutes slow on New Year's Eve. The crowd on our side of the harbour must have been watching the tower because only when a roar of cheering was heard from the other side of the harbour did our side erupt with the realisation that 2009 had arrived at last. Posted in Street photography and tagged night, v&a waterfront on Friday, 2 January, 2009 by Paul.